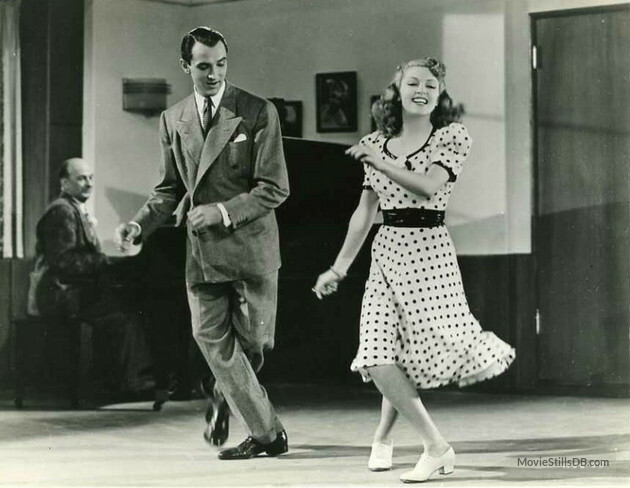 18-year-old Lana Turner charms in DANCING CO-ED (1939), a most enjoyable MGM film available from the Warner Archive. Lana stars as Patty Marlow, who is "planted" by a movie studio on a midwestern college campus. Patty is a dancing whiz Monarch Pictures plans to cast in a musical opposed Freddy Tobin (Lee Bowman) when his wife (Mary Beth Hughes) must bow out due to pregnancy. Publicity man Joe Drews (Roscoe Karns) concocts the idea of conducting a casting search at several colleges -- which Patty will conveniently "win." Meanwhile, sweet studio secretary Eve (Ann Rutherford), who accompanied Patty to college, has unexpected talents of her own. I fondly remembered this film, which I first saw back in 2007, and it was as entertaining as I recalled. There's some creative staging, as the plot is briskly laid out using a series of "whip pans" introducing various characters. There's also an interesting splitscreen moment for simultaneous action, with a horizontal line dividing the screen. It's different and thus rather eye catching. The young leads are charming, and then for good measure there's plenty of Artie Shaw and his band, including the grinning 21-year-old drummer, Buddy Rich. Things like that are just gold for those who love the music of the era. 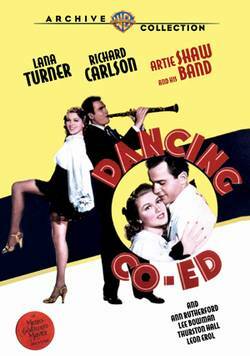 Turner and Rutherford's extensive MGM training shines in this film, with Turner in particular very credible in her dance scenes. She and Shaw, incidentally, were married for a few months in 1940, the beginning of Turner's long-running misadventures in marriage. The head of the college is played by Walter Kingsford, who was hospital chief Dr. Carew in the Dr. Kildare series which began the previous year. He looked so at home in his office, I rather suspect the set might have been Dr. Carew's office! The placement of the desk and doors was familiar. I know I've seen the Blair General Hospital sets turn up in other movies of the era, so it wouldn't be surprising if that set was repurposed. Mary Field is becoming one of my favorite character actresses; for someone who often played spinsters or repressed types, the truth, looking at her closely, is that she was really rather pretty. She's quite fun here as the college dance instructor who recommends Patty to the studio execs. The cast also includes Monty Woolley, June Preisser, Leon Errol, Thurston Hall, and Chester Klute. Rand Brooks, who was Charles Hamilton of that year's GONE WITH THE WIND, can be spotted briefly; Ann Rutherford, of course, was also in GWTW, as Scarlett's sister Carreen. DANCING CO-ED was directed by MGM "B" movie specialist S. Sylvan Simon. It was filmed in black and white by Alfred Gilks. The running time is 84 minutes. The Warner Archive print is excellent, with some terrific close-ups. The disc includes the trailer. Fan of Turner, Shaw, or MGM films of the era will want to be sure to check this one out. I'm a BIG fan of the music of the Artie Shaw band 1938 on for the next decade. Some stunning and original music. If you haven't seen this, as a Shaw fan you'll get a kick out of it! I was fortunate to see Buddy Rich in concert with Frank Sinatra in 1983, just a few years before Rich passed on. There are a couple shots of him in this which are such fun. He was so young! I adore this film! And These Glamour Girls too which pairs nicely with this one. This is such a fun film. It's so interesting to see how Lana Turner's career would change two years later. She could have been a great musical comedy star. Delighted you enjoyed it! It's a fun one for sure.